The Great Ape Run is back - the Wicklow Kennedy Cup team will be scouring three towns in Wicklow back-to-back in one day for their campaign and Crumlin Children’s Hospital. Follow the action here. In case you didn’t believe me about rayD8, here’s a whole roomful of people not believing me about rayD8. 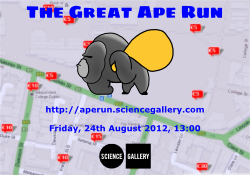 The Great Ape Run for Science Gallery's HACK THE CITY exhibition is powered by apeworks. apeworks is a small group of acquaintances, most working in the software industry. They were were initially set up to write one or more enjoyable multi-player, java-based computer games, to bring quality software into the public domain, to bring peace and enlightenment to the world and, most significantly, to relieve boredom. We're not, sadly. Everything we do here is out of the goodness of our squishy little hearts.